Connect PS/2 Keyboard and Mouse to USB Computer. Connect PS/2 Port on KVM Switch to USB Port. 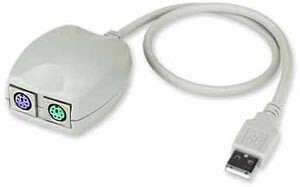 The USB to PS/2 Adapter allows you to connect your PS/2-compatible mouse and keyboard as USB compatible devices. Connects NTI legacy KVM switches to PS/2 with USB port. Supports two PS/2 devices (Keyboard and Mouse) and converts to the USB Interface (PC, MAC or SUN). Converts the user USB port of a NTI USB KVM Switch to a PS/2 (Keyboard and Mouse). Converts the PC PS/2 port of a NTI KVM switch to a USB port (PC, MAC or SUN). No software driver is needed. Supports standard PS/2 mouse, IntelliMouse®. Compatible to USB 1.0 and 1.1 Specification. Transfer Rate is 1.5 Mbps. PC Windows 98/SE/ME; Windows 2000; Windows XP; Windows NT. Netware 4.11, 5.0, HP Unix, Linux. Apple computer G3/G4 MAC O.S. 8.6 or higher. Props Left Window + Left Ctrl Find Left Window + F3 Paste Left Window + F7 Mult Left Window + "1"
Compose Left Window + Left Shift Again Left Window + F4 Cut Left Window + F8 Vol - Left Window + "2"
Front Left Window + F1 Undo Left Window + F5 Help Left Window + F11 Vol+ Left Window + "3"
* Use the chart above to type SUN's additional 14 keys with a Windows keyboard. "The USB-PS2 adapter is a slam dunk — excellent performance for the price. The ordering process was a piece of cake, and the sales staff was great also. We will be buying from you again."